Home › Investing › Broker › Is thinkorswim The Best Options Trading Platform? 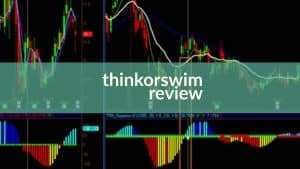 Is thinkorswim The Best Options Trading Platform? When thinkorswim burst onto the online options trading scene back in 1999, it redefined the standard for options trading platforms. The founding team at thinkorswim were options traders, and that hands-on practicality led to a souped-up options platform that continues to set the bar against which other trading platforms are measured. thinkorswim was so successful in carving out a path as the top options trading platform that TD Ameritrade purchased it in 2009. Since then, options commissions have dropped to a mere $6.95 per online equity trade and $6.95 plus $0.75 per contract for online options trades. To narrow the scope of comparison to pricing alone would be to do a disservice to thinkorswim. Decades after it was founded, thinkorswim remains among the best options trading platforms with a combination of free tools, simulators, back-testing strategy features, mobile-friendly interface, and virtual trading capabilities to delight active and experienced options traders. Virtually any options trading strategy imaginable can be placed at thinkorswim accurately and quickly thanks to its world class technology and deep understanding of options trading risks. Whether you are getting started with options trading for the first time or an old pro, thinkorswim can cater to all levels by supporting virtually any imaginable options trading strategy. Beginners who may want to protect stock positions with married puts, sell premium for the first time with covered calls or reduce volatility with collar trade strategies can do so easily. Experienced options traders seeking theta-decay strategies, such as bull put and bear call credit spreads, as well as more exotic options trading strategies, including iron butterflies, iron condors, ratio put spreads and ratio call spreads won’t be disappointed either. Bullish and bearish investors who favor standard debit spread options strategies, such as bull call and bear put spreads are supported too. The reason thinkorswim can cater to virtually any options strategy imaginable is that risk is well understood and its technology is about as good as it gets. Where some other platforms may run into difficulty figuring out risk levels on complex options strategies, thinkorswim has no problem with such number crunching. And its technology has proven over the years to be top tier, so fast and accurate order execution is par for the course. At thinkorswim, you can create your own technical indicators with thinkScript, learn new strategies risk-free with paperMoney, roll covered calls automatically with Strategy Roller, screen extensively and analyze intelligently with over 300 existing chart studies. The challenge you will find at thinkorswim is not that you cannot find the tools you want or need but more so that thinkorswim offers so many you might feel overwhelmed by the range of options available. If you can restrain yourself from feeling intimidated by the extensive selection of tools at your fingertips, you will be well rewarded by a platform that rivals anything the pros might use when trading big money. thinkorwim boldly claims that it has more technical studies than any other platform. Indeed, no other platform comes close to thinkorswim for feature rich charts. Charting options include time charts (most popular), tick charts (intraday action), and range charts (representing price accumulation). Various chart modes are available too from standard to monkey bars, which display price action at specific price levels over a fixed time period. You can even find seasonality charts intended to uncover seasonal patterns that combine both fundamental and technical methods. It is easy to customize your charts at thinkorswim. You have control over price and time settings, as well as quick time frames so you can toggle quickly between your favorite time periods. As an options trader you get to control various settings too, and that customizability extends to equities, futures and forex traders also. Where thinkorswim shines is in catering to the needs of virtually any trader, no matter how seemingly obscure their preferences. For example, studies can be set up to Thermo Mode, which allows an indicator to show plot values using many lookback time intervals, and assigns specific values to the smallest and largest values. A more common demand options traders have is to draw on charts, and thinkorswim makes it easy to do so whether on standard classic charts or Japanese candlestick charts. Fast Beta is a trademarked service by TD Ameritrade that weights recent pricing data more heavily than older prices. The idea behind Fast Beta is to analyze stocks that become more volatile or break out of historical trends. This tool may be especially valuable to volatility traders who can take advantage of straddles and strangles that benefit from large price moves, such as those that occur after earnings events. At most brokerage firms, you get what you see when it comes to tools and charts. On its thinkorswim platform, TD Ameritrade has turned convention on its head. Where traders usually must make do with the tools provided by the trading platform, they now have the choice to modify existing studies and charts through thinkScript, an embedded programming language. With thinkScript, you can add your own studies to over 300 existing strategies and studies to allow you create your own ideal technical indicator. Sometimes you may wish to filter out stocks or options that fall short of certain criteria. And you will want to search for stocks that meet various thresholds you stipulate. For example, you may wish to sidestep penny stocks in favor of stocks with larger market capitalizations. The Scan feature is just one of the many powerful aspects of thinkorswim that make it a top contender for best options trading platform. Scan includes Stock Hacker, a scanning tool, which features a Sizzle Index so you can identify stocks with unusually high volume. Plus standard study filters are in place that enable you to narrow the search range for symbols. 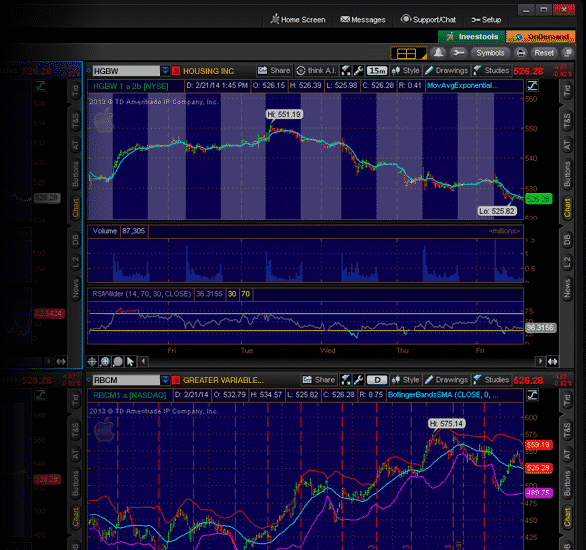 Among the most powerful options trading tools on the thinkorswim platform is Strategy Roller. Covered call traders may find virtual trading nirvana with Strategy Roller because it automatically rolls forward covered call options on stocks you want to hold for a long time so you can be hands-off. If you own a fundamentally solid stock, such as Alphabet, that you plan on keeping in your portfolio for many years to come, Strategy Roller will continually sell call options against your share ownership position. If you are trying out a new options trading strategy, such as a bull call, you probably will want to understand the finer details of the strategy before dipping your toes in the water with real capital. paperMoney is designed to let you test-drive strategies at such times so you don’t have to risk a dime while you are in a learning phase. Fees at thinkorswim across the board are competitive and in line with industry norms. Some discount brokers may squeeze thinkorswim on price but few match thinkorswim on value. If dollars counted as votes, thinkorswim would win the prize as the best options trading platform among options traders, who have flocked to the platform for years. Both experienced and beginner options traders alike will find value with low commissions and a dizzying array of tools. Beginners may find the platform a little intimidating at first glance because so much functionality is packed into the trading platform but if you can hang tight and stick with it, the rewards are worth the commitment. Experienced options traders will find a virtual trading nirvana at thinkorswim. It is easy to roll covered calls automatically, screen for stocks and options, analyze charts with over 300+ technical studies, and even program your own technical indicators using an embedded programming language called thinkScript if you feel ambitious! The bottom line is thinkorswim stands at the top of the heap when ranking the best options trading platforms and earns a 5-star rating.